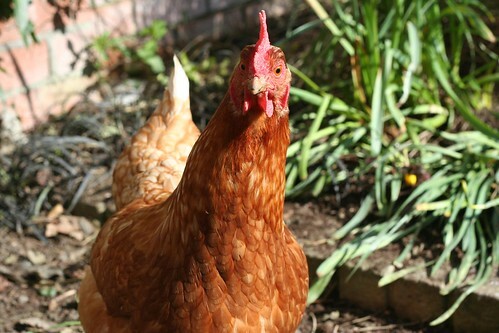 As soon as I posted some pictures on facebook of the hens I got an email from one of the other girls who was in Ballymaloe with me asking about how I was getting on. 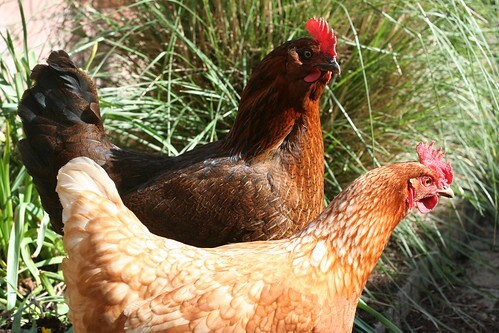 And no, they still have no names other than the dark one which we call mad hen because she is quite clearly insane. Here are some of the questions that came up. Keep them in the coop or let them out? For the first few weeks we had them in a coop and run and didnt let them out of there. Because my garden is small we decided to put wood chippings under the run and then change them every month or so rather than moving the hens around the garden. We also dont have any grass in the garden so this seemed like the best option. Before getting hens I had read a bunch of articles, a few books and some websites and this practice seemed fairly common. Most books recommend keeping them in their coop for the first 24 hours and within their run for at least the first week (but I did see recommendations of up to a month). We only let them out for the first time after about 2 weeks because we wanted to make sure they knew where they were going back to at night, to lay eggs etc and we also didnt want to let them out without clipping their wings (after both of them escaping the first day and we were a bit chicken about clipping the wings so it took us some nerves to get arond to it). Now that we have them over 2 months we keep them in the run during the day sometimes and let them out in the evenings, other days we let them out all day. Mostly we close up the coop at night but we find they are happier when they can get out themselves in the morning to get at food. I was a little nervous at first about letting them out during the day when I wasnt there but there have been no issues (other than a lot of poop and them getting into my veg once). What about the rest of the garden?I fenced off the area where Im growing veg but let them roam around the rest of the garden (which isnt too tidy anyway). They dont seem too interested in flowers or plants and mostly wander around behind where I have flowers planted. If I was planting anything new I would definitely fence it off though in case they trample on it. They do fairly dig the place up so if you were letting them out it would be a good idea to fence off areas you dont want them going near. My garden isnt very big but they seem happy both in the fenced in area and wandering about. 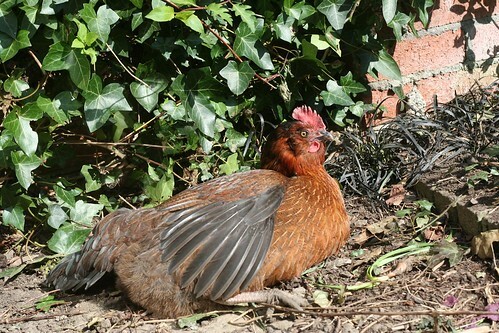 They are good fun to watch, one of them keeps pecking the window when she sees us inside hoping to get at the plants growing inside and both of them jump to catch insects and spend half their days picking slugs out of the ivy near our back door. They both then argue for whatever snails they do find. They go in automatically at night once it starts to get dark, eat only what they need - we leave out layers pellets every morning and dont make noise (only really when laying eggs which they do between about 10 and 11 every day). We clean them out about once a week (the coop has a tray which we just remove and empty into the bin), take their eggs every day (1 each per day), and remove their food every night and put it back in the morning (Im a bit afraid of vermin). They do poo quite a bit around the garden - apparently this is great compost so Im currently keeping a garden brush at the back door to sweep it into the borders as I see it. What if you want to go away? On the few times we have been away one of our friends popped in for the eggs (if you leave the eggs in the nest too long apparently they get broody and try to hatch the egg). We had left enough food and water for the 2 days that we were gone so we didnt need to worry about that. 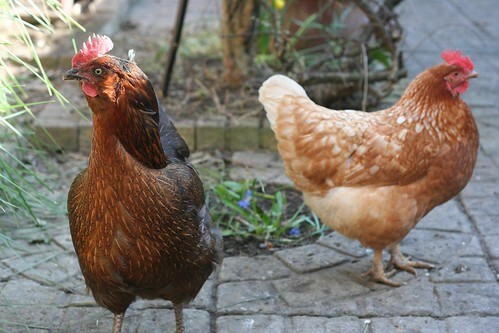 The reward of the eggs was all the payment our hen-sitter wanted. When we were away their run door was closed but the coop door was open so they just went in and out when it was bed/morning time. To be honest though, I dont really buy much pork other than in rasher or chorizo form. There is almost always rashers and chorizo in my fridge, so handy and tasty and fantastic for a quick dinner after work (which reminds me of about 6 recipes I should post). So when I got a big lump of loin of pork I had to have a good think about what to make. I hadnt made this recipe in a good while so it was the first to come to mind. 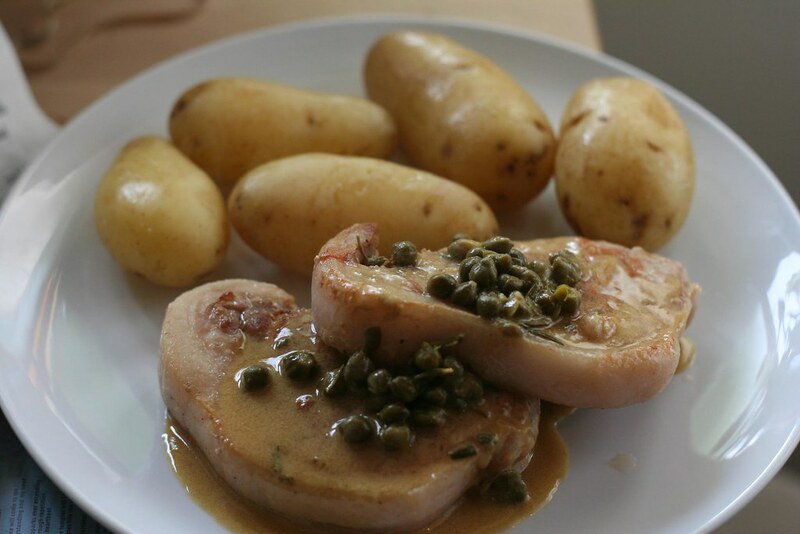 Its a version of something a friend gave me from a course she was on somewhere once and it doesnt sound like it would be as fantastic as it is, its also quick and tasty and doesnt require any very silly ingredients that you wouldnt find in most shops. In fact this is the perfect thing to eat in the middle of the week when you want something fantastically tasty but dont have the time to think and dont want to call for a takeaway. 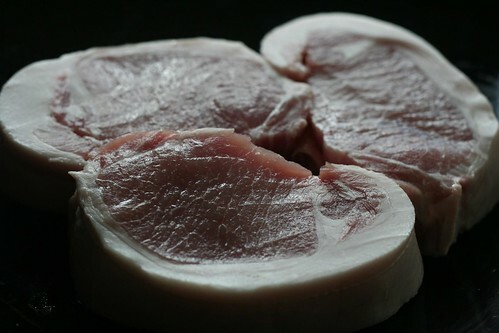 3-4 thick loin pork chops. My butcher will cut me ones almost an inch thick. In a large frying pan, heat some olive oil. 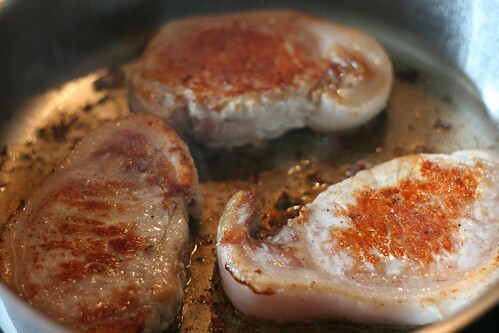 Season the chops with some salt and pepper and cook in the frying pan for 4-5 minutes on each side until well browned. Remove from the pan to a plate and keep covered to let them rest. Drain your frying pan a bit. Add stock, capers and rosemary to the pan and reduce to about half. Return the chops to the pan and simmer for a few minutes until youre happy that they should be cooked through. Remove the chops again. Whisk the mustard and butter into the sauce. Check to see if you need to add some extra salt and pepper. Pour the sauce over the chops and eat. This is really good with some boiled potatoes and broccoli.